Website: None, but there is a Twitter page which post information about the trail and possible trail closure due to rain and or maintenance. Directions: SCT is off FM1826 not far from HWY 290. From IH 35 exit Slaughter Lane going west approximately eight miles, then turn left on 1826, pass over a small creek with a dam on the right, then SCT will be immediately on the left. It can be easy to miss. There is a metal gate with gray brick pillars at each end and a white sign which states Water Quality Management Area above a green address sign. From 290 go south on 1826 and pass W. Slaughter Lane then follow the directions listed above. 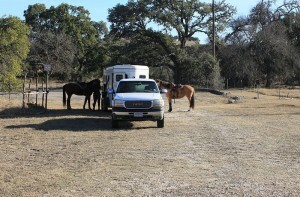 Horse trailer parking at the SCT trail head. This shot is taken from trail coming back towards the trail head. Facilities: There is no water at SCT so be sure to bring plenty for you and your horse. Portable/chemical toilets are located at the trail head. Designated horse trailer parking is located at the trail head behind the historical house . The small horse trailer parking area is half pavement/asphalt and half grass/gravel. Once the designated parking area is full the trail is at capacity limit and you will need to try again later. There are no other facilities. Overnight Camping and dogs are prohibited at SCT. Hours of Operation: The mechanical gate at the entrance off 1826 automatically opens at dawn and closes at dusk, so be sure to give yourself plenty of time to exit SCT before dark to avoid getting locked in behind a closed gate. Mileage: The five mile loop trail at SCT is shared by equestrians, hikers, and cyclist. Terrain: SCT is in central Texas Hill Country. The ground is mostly hard black dirt and rock. There are sections of trail free from rocks but most of the trail is fairly rocky. The trail is also a mix of wooded shady pathways and open trails with no cover. Most of the trail is flat with some mild inclines/declines. There is not steep grades, gullies, or hills on the trail. There are no water sources on the trail as well. Cyclists are to yield to Horses, unlike the scene in this photo. Unfortunately I don't have a photo displaying proper trail etiquette. 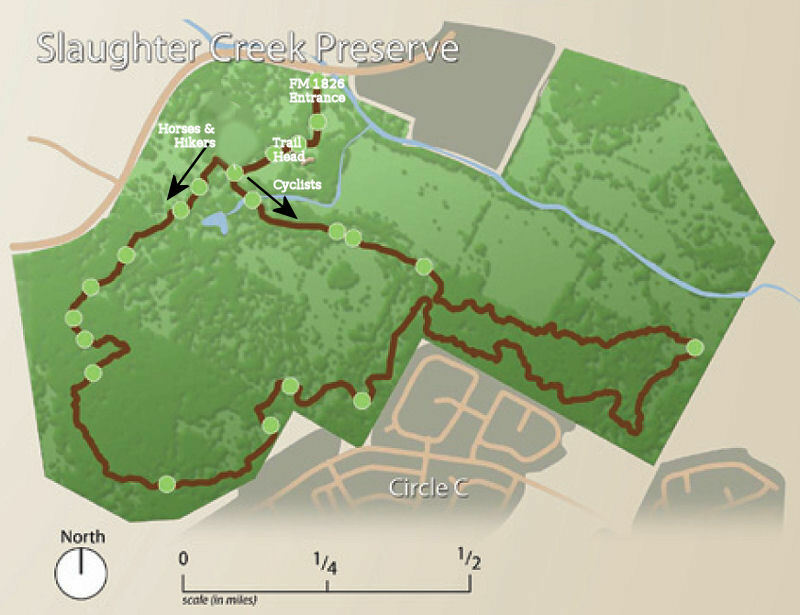 Description: Slaughter Creek Trail is an environmental preserve managed by Water Quality to improve and protect water entering Edwards Aquifer. The trail was built by volunteers from Austin Ridge Riders and Austin Metro Trails and Greenways funded through a grant from the Texas Parks and Wildlife Department and opened for public access in early 2010. Educational signs are located along the trail about the land, water, and history in this area. 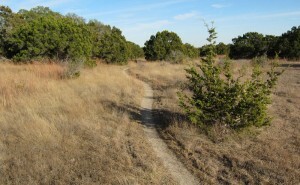 The trail consists of two loops totaling five miles. 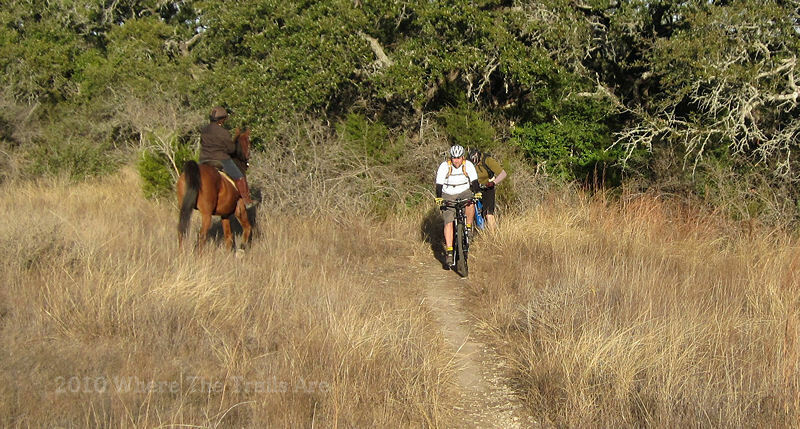 The one track trail consists of two way traffic between equestrians, hikers, and cyclist. 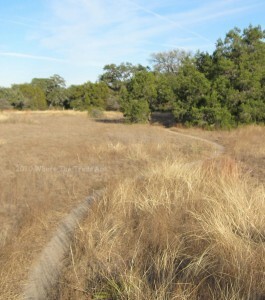 From the trail head, equestrians and hikers travel to the right while cyclists travel to the left. This allows the horses to see cyclists coming directly at them instead of coming up from behind the horse. Cyclists and hikers are both expected to yield to horses. 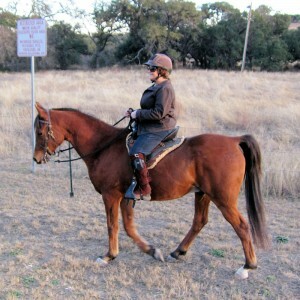 I enjoyed the trail with my American Indian Horse Angel and my friend Carol aboard her tall Arabian Ace. Both horses have seen cyclists before, however Angel has had less exposure to them than Ace. I would not advise riding this trail on a horse with no previous exposure to cyclists. Angel startled a little at the first two cyclists we encountered on the trail but after that she was a pro. I loved the exposure she was getting to all the cyclists and can say with confidence she is now well desensitized to them coming straight at her. During our ride the cyclists traffic was heavy, we only saw two groups of hikers, and we saw no other equestrians. All of the cyclists and hikers were polite and friendly. Only about sixty percent of the cyclists stopped for us and pulled over so we could pass (following park rules and trail etiquette) . The rest mainly slowed down while we pulled over for them pass us. When this happened, with the exception of a few cyclists, most did ask permission to pass and I’m sure they would have stopped had we asked them to. I would advise keeping your pace at a walk when coming around blind curves in the trail to avoid a head on collision with an on coming cyclists. I do not recommend use of this trail for endurance training due to the traffic and low mileage. SCT is perfect for an easy ride, taking refuge from the busy city, and most importantly learning about the importance of water quality management. Being in a larger city the trails did come close to some neighborhoods, traffic sounds, and the skyline occasionally gave way to views of the city. 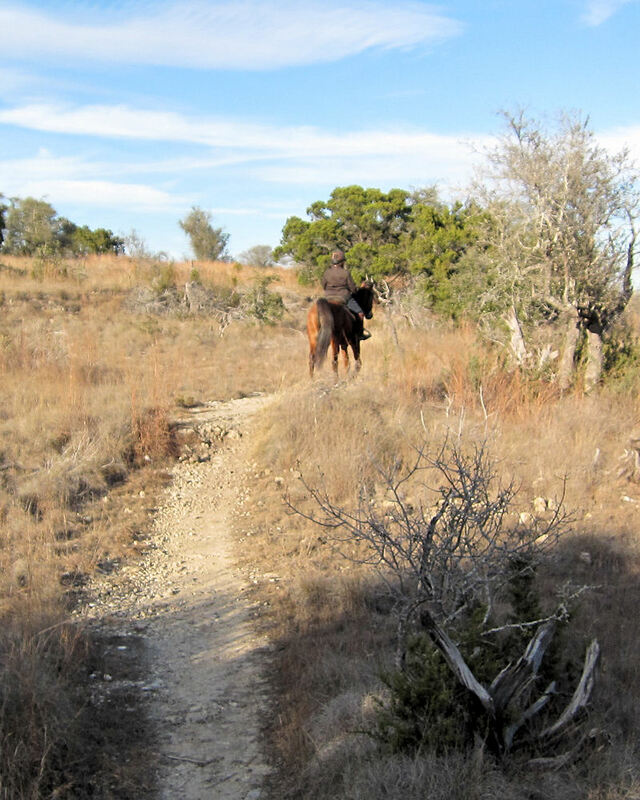 Unfortunately, we did not see a great deal of wildlife as we rode down the trail. I suppose we were just unlucky as I’m sure this preserve provides a great habitat for many species. Just as we were returning to the trail head I could hear the lovely sound of an owl. 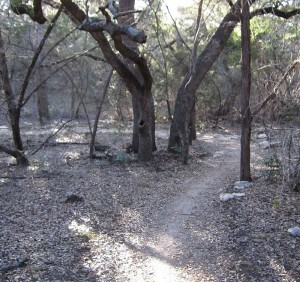 It is always refreshing to discover new trails to ride, especially when in a large metroplex such as Austin. • Please remain on marked trails at all times. This is to ensure that land is preserved and protected for good water quality. 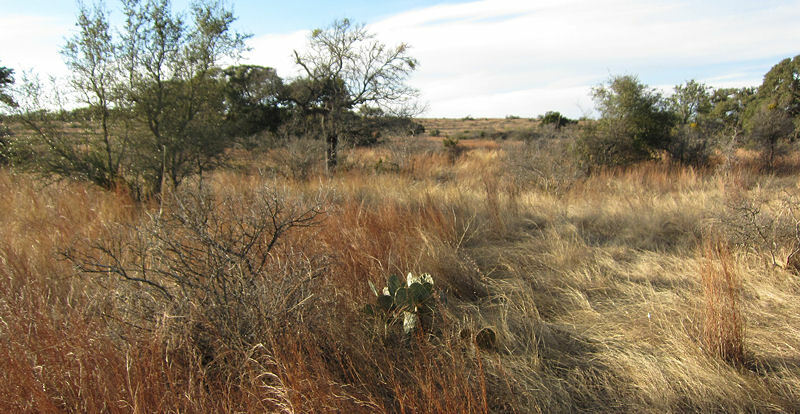 Do not attempt to create new trails or explore the tract on your own. • Trail traffic is two-way. Hikers and Horses go one direction, Bikes go the opposite direction. Bikers yield to hikers and to horses. Hikers yield to horses. Horses have the right-of-way. • Temporary closures may occur for the following reasons: in the event of heavy rain, during preventative maintenance activities either on the trail or on the tract, when threats to public safety may be present. • Enter and exit only by the established trail head. • Children must be accompanied by an adult and should be supervised closely at all times. • Pack it in. Pack it out. No trashcans are available. Take out whatever you bring in – Horse manure in parking lot or staging area shall be disposed of offsite by riders/owners. • Please limit groups to 6. If you have a larger group, please split up into smaller groups. • Emergencies – Call 911, and provide address: 9901 FM 1826. If possible, designate someone to meet emergency responders at gate. • Crime in progress – Please call 911 and report your location and the specific vandalism or damage. • No water available – Please carry enough for you and your horse(s). • Parking – allowed in designated spaces only. When lot is full, the trail is at capacity. Please come back later. • Leave no Trace – Take out what you bring in.